CCTV shows Arab terrorist's brutal attack that caught two Jews by surprise in a Mishor Adumim supermarket to the east of Jerusalem. 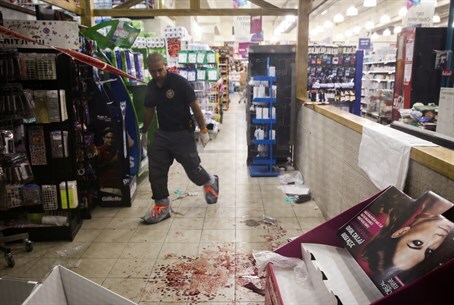 In-store security cameras picked up the brutal stabbing attack on Wednesday, in which an Arab terrorist stabbed two Jewish shoppers at a Rami Levy supermarket in Mishor Adumim, located near Maale Adumim to the east of Jerusalem. The two victims, aged in their 50s, suffered moderate head and shoulder wounds from the knife attack that caught them off-guard as they stood shopping in the store's aisle, unaware of their 16-year-old Arab attacker standing beside them and preparing to strike. The video also shows the armed security guard who happened to be shopping in the store at the time and chased down the terrorist and shot him, leaving him lightly wounded. Two other suspects were arrested following the attack, including an Arab worker at the supermarket which hires both Jewish and Arab workers. Police suspected that the knife used in the attack belonged to the store, and was given to the attacker by the employee. After a media flurry was raised over Ashkelon Mayor Itamar Shimoni's decision to limit Arab construction workers on sites near kindergartens, there was an outpouring of criticism, with Economics Minister Naftali Bennett (Jewish Home) going as far as to claim 99.9% of Arab citizens of Israel are loyal to the state.